We manufacture one double fretted and one triple fretted clavichords. The RWC double fretted clavichord closely follows an anonymous instrument dated C1740 in the Gemeentemuseum, Den Haag, Netherlands. Compact and portable it has a compass of C - e''' being enough for J.S.Bach's keyboard music and much else. It is also double fretted, which interferes little with playing as no more than two adjacent notes share the same strings. A double fretted instrument requires fewer strings for the same number of notes making tuning easier and reducing downward pressure on the bridge. Combined with the light, positive keyboard action the result is an instrument which produces a clear tone capable of a wide dynamic range. Solid brass tangents act on brass strings (bottom octave copper wound on brass) and the instrument can be tuned to either a=415 or a=440. Disposition: 4 1/2 octave C - e'''. Size: 115cm long, 36cm wide, 11cm deep. Weight: 12kg. The finished clavichord includes the panelled lid and straight stand. 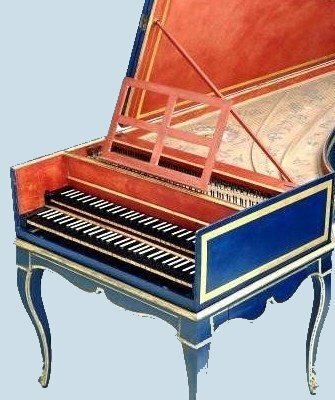 A finished clavichord with a soundboard painting can be arranged for an extra cost. A cassette recording of music by Bach, Haydn, Howells and Bartok played on this clavichord by John Cramer is available. The RWC triple fretted clavichord is based on an illustration in Praetorius' Syntagma Musicum, 1618. The instrument although compact is still very resonant due in no small part to its system of triple fretting. We have chosen to use oak for the main construction of the casework with traditional iron wire hinges, hasps and fastenings. A Swiss pine soundboard and hand carved lime keys with solid brass tangents acting on brass stringing give the finished clavichord its considerable dynamic range. A simple hard carrying case is available as optional extra for safe transportation if required. In addition, you will find a lid a stand and a soundboard painting set specially designed for it. The Double Fretted Clavichord is the easiest of all our keyboard kits to build. Only traditional materials are used for this remarkable kit. All parts have been accurately machined from selected timbers ready for final assembly. Mahogany for the casework, Colombian pine for the baseboard, Swiss pine for the soundboard, beech for the framework and planked lime for the keyboard. Brass strings are used throughout with a wound copper bottom octave, all struck by solid brass tangents. Tuning the instrument to a=440 and setting the 1/6 comma temperament (one of the most suitable for the music of Bach) are described in a most complete instruction manual written by the late John Barnes. Designed as a table top instrument the lid, carrying case and stand can be added later. If everything is ordered together there can be a significant saving in shipping costs. The Panelled Lid kit is an optional extra where the parts are machined completely from solid timber with the panels themselves constructed in the traditional way to allow for the natural expansion and contraction of timber. The Straight Stand kit is made from timber to match the clavichord. Machined to a high standard the stand is simple to assemble whilst its innovative design allows it to be flat-packed for ease of transportation. The Soundboard Painting set has been specially designed for this instrument. 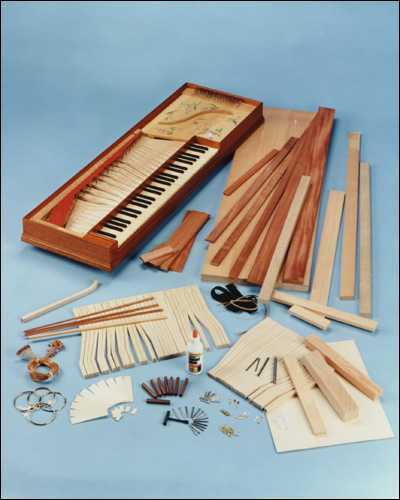 The Triple Fretted Clavichord kit is intended for regular kit builders. The part preparation has been kept to a minimum with all the timber cut to width and thickness only. The constructional information taken from a 1:1 scale drawing rather than an instruction manual and it is assumed that the builder has a good selection of hand tools, access to a small bandsaw and a degree of skill in the reading of the recommended bibliography. All the necessary hardware, stringing, tangents, balance pins, etc is provided. A series photographs showing close up details of a finished instrument completes the kit. A simple hard carrying case is available as optional extras for safe transportation and there can be a considerable saving in shipping costs if the case is ordered with the kit as everything can be packed into the case and sent in only one crate. You can make the same Clavichord from scratch, following detailed step-by-step instructions through the construction process in a clear and concise manner. These prices are published as an estimation and are subject to the possible variations by the manufacturer. We will check the actual price with the manufacturer and confirm them before accepting your order.